Buoyed by a rapidly developing economy and a booming infrastructure sector, cement companies are smiling all the way to bank during this quarter as well. Though the historical track record suggests a slowdown for the cement industry in Q2 due to the Indian monsoon season, this fiscal has been markedly different. Combined bottom-line figures of 11 companies have grown by a whopping 444% for the first half of the current financial year. The IT sector has come out good as always. While Infosys has posted a 48% top-line growth for H1, both TCS and Wipro have grown by 47% each. Pharma companies showed 22% top-line and 30% bottom-line growth. The gross turnover figures of auto and auto ancillary sectors have risen by 18% and 23%, respectively. The banking sector too has posted growth of 31%. 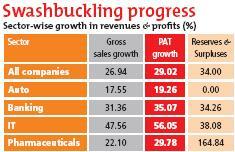 Other sectors, where most companies declared their results, also showed profitable growth.